Should You Let Your Spouse Handle All The Finances? We have talked before about money and financial issues within marriage and relationships, and today we are addressing another topic that has come up in conversation. Should You Let Your Spouse Handle All The Finances? No matter your situation regarding jobs, income and who makes more or less, this is a question worth entertaining. While my gut instinct is to say no, there are exceptions to this rule that we will look at. The average couple will both be highly involved in financial decisions. Whether you are choosing to have your finances mingled and sharing all income in joint accounts, or keeping things separated will determine if this question is even one you need to entertain. We will assume for the sake of this question and post, that you are indeed sharing all income and have a joint financial account and system. Deciding who handles the finances is a very sticky subject for some. While it is my personal opinion that all couples should be equally involved in the family and household finances, there are some exceptions to that rule. One spouse has poor past money management that has created debt or financial strain, and has not made changes to improve or learn how to budget properly. One spouse has difficulty with numbers, math and financial topics in general. There are occasions where numbers are not a strong point for an individual, and it would be beneficial for the stronger spouse to handle financial decisions. A spouse is ill and unable to truly care for financial concerns for themselves. Exclusive financial control can often be the sign of abuse within a relationship. When one spouse wants to control any aspect of their marriage it often means they wish to exhibit control over that person in other areas. Mutual teamwork regarding financial decisions is important to make your relationship stronger. Both parties contributing is what is needed for optimum success without hurt feelings, bitterness or anger becoming an issue. Unhealthy financial habits can easily be hidden when only one person is handling the finances in a relationship. This can lead to future issues in the relationship. 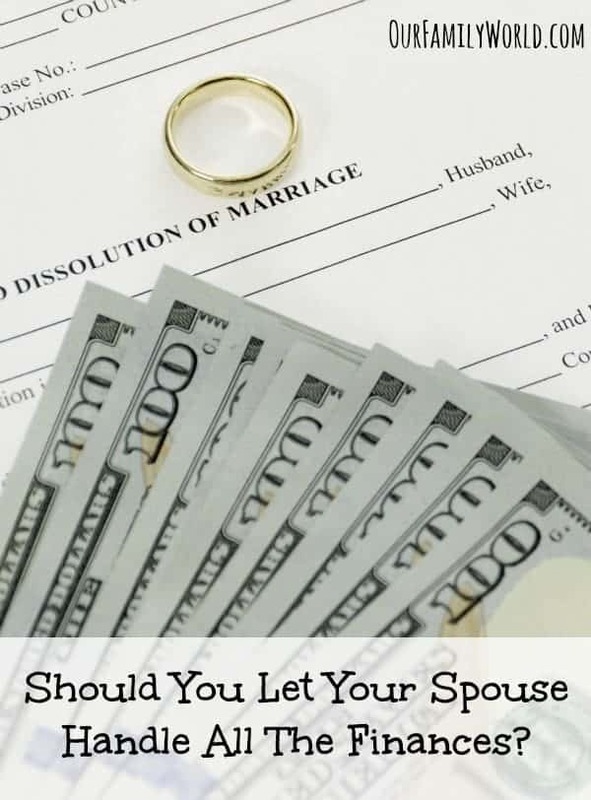 While the question of letting your spouse handle all the finances may indeed come up in your relationship, it is one I don’t believe is a good decision to say yes to. There are a lot of healthy relationship where one person pays the bills, but they work together as a team to understand what needs are there and how to handle them. Open communication is so key to a successful relationship. That includes financial decisions. What do you think? Should you let your spouse handle all the finances? I like handling the finances and my boyfriend agrees. He is more then happy to have me in charge making sure everything is paid and pain on time.